Whilst the political parties were engaged in widespread blood-letting at Westminster over leadership contests, it was invigorating and reassuring on July 1st to have Oliver Cox talking about the life and work of Lancelot "Capability" Brown, often referred to as "England' greatest gardener" following his influence in over 170 parks surrounding some of the country's finest country houses - and with many designs, such as those at Blenheim, still intact. 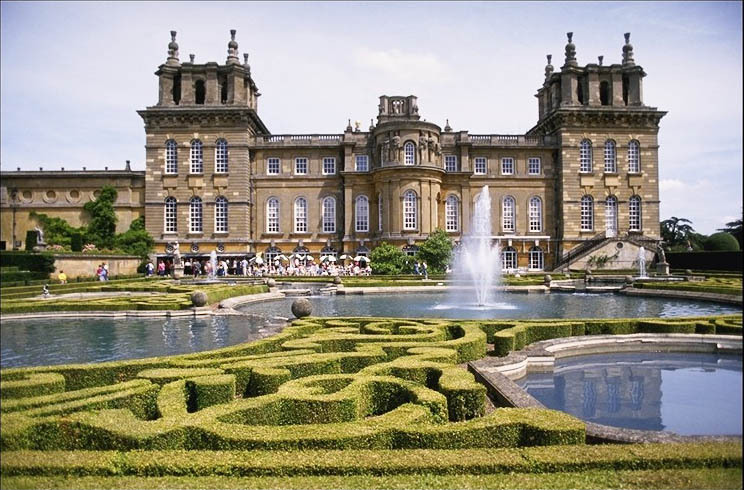 In the light of momentous political events, with the UK voting to leave the European Union, Oliver suggested it was a good time to reflect on our national identity - something which Capability Brown, as the man behind England's green and pleasant land, had done a lot to shape. On this 400th anniversary of Shakespeare's death, Oliver pointed out that - what The Bard has done for English letters - so Capability has done the same for the English landscape. Oliver suggested it's possible to argue that Brown's success was such that he almost fell into historical obscurity through creating a product so good that subsequent generations of visitors have often given Nature alone the credit. But Oliver said that in 2016 - the 300th anniversary of Brown's birth - it was the perfect time to add him into the popular pantheon of English artistic heroes, alongside Shakespeare, Wordsworth, Constable (and even, mischievously, David Bowie). He added that, unlike with the artist Turner, it is possible to sample Brown's work without having to go into a gallery and there are over 30 landscapes in London alone - and within a twenty-mile radius of Wootton, there are examples of Brown's work at Blenheim, Stowe, Wotton, Thame Park, Rycote and Compton Verney, as well as a number of smaller landscapes. But Oliver pointed out that it was only three miles away at Kiddington Hall, where it all started for Brown when he appeared there, aged only 23, in 1739 armed with an introduction from his former employer, the Northumbrian landowner, Sir William Lorraine, to the owner of Kiddington, Sir Charles Browne. It was Sir Charles who gave Brown his first break in southern England - when Capability helped create the lawns and lake in front of the existing classical house, with the source of the lake, the River Glyme, to which Brown would return about 20 years later for his work downstream at Blenheim. 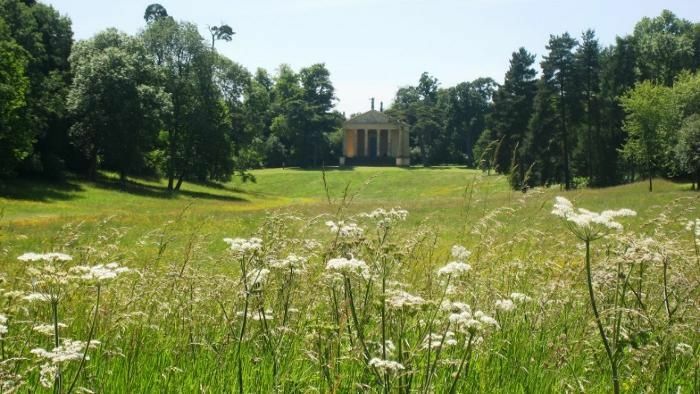 After Kiddington Park, Brown moved to Stowe, in Buckinghamshire, where he hit his stride - an estate which Oliver described as "absolutely remarkable, breathtaking and inspiring" and a place of artistic ingenuity and "staggering creativity". The next couple of centuries were to see a stream of famous artists and architects working at Stowe, including Sir John Vanbrugh, William Kent, James Gibbs and Sir John Soane. 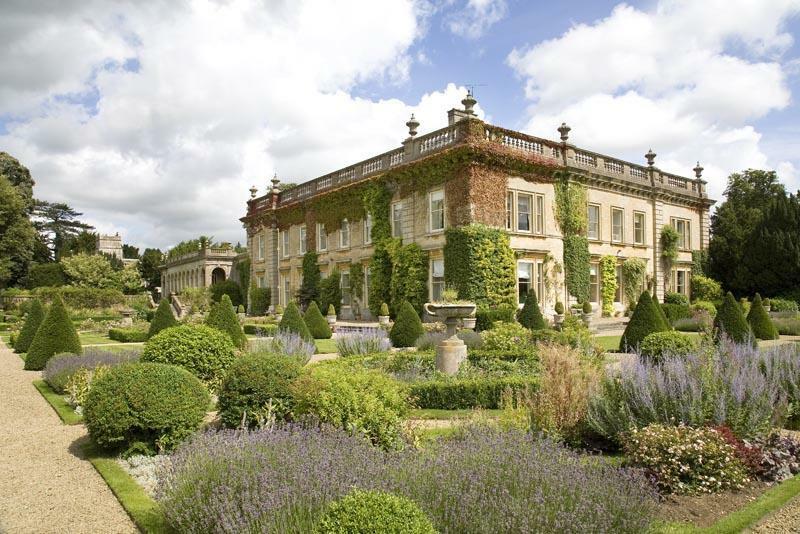 The house and garden were already well-known when Brown arrived there in 1741 after politics, sociability and great art had combined to make this part of Bukinghamshire the epicentre of English society. For the past 20 years, added Oliver, Stowe had been a laboratory for experimenting with different types of landscape styles. And the owner, Lord Cobham, now dedicated the latter part of his life to using Stowe as the artistic expression of his belief that Britain should be a world power. Oliver suggested that those young men, such as Kent and Gibbs, clustering around Cobham saw art, landscape and poetry to be intimately connected with politics. Into this atmosphere, Capability Brown started work as Lord Cobham's head gardener and five years later, in 1746, he started on the project that would make his mark at Stowe - the Grecian Valley, where visitors could imagine themselves as the poets of Classical Antiquity, although the ;project did require the excavation of about 24,00 cubic yards of earth, using both male and female labourers. 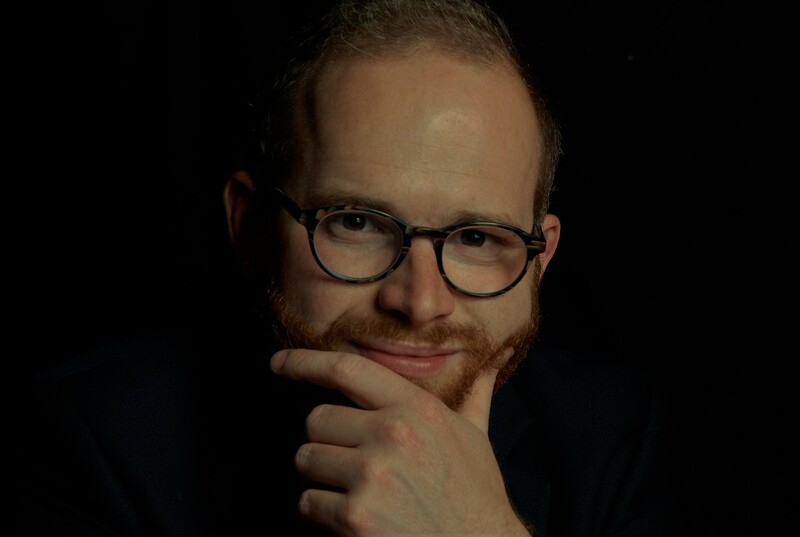 Oliver pointed that Brown's time at Stowe provided him with a remarkable networking opportunity and his "brand-reputation" started to develop. One frequent visitor to Stowe in the 1730s and 1740s - and a key networker and supporter - was William Pitt, who would dominate the political landscape for decades and his continuing support in opening doors for Brown resulted in commissions at Petworth, in West Sussex, Wotton, Stratfield Saye and Burton Pynsent. Brown also fell in with a group surrounding Sanderson Miller, a member of the Warwickshire gentry who, in the middle of the 1740s, was experimenting with a different type of Gothic Revival architecture - and less rococo-fancy. He introduced Brown to a series of clients, including George Coventry at Croome, near Worcester, Lord Guernsey at Packington, the Lucy family at Charlecote near Stratford, Lord Brooke at Warwick Castle and Sir James Dashwood at Kirtlington Park, just a few miles from Wootton. Oliver told us that Brown's landscapes were simple, uncluttered and restrained - generally comprising sweeping pasture bordered with tree clumps, perimeter shelter-belts and screens of trees. He swept away formal parterres and the classical allusions of the previous age - but also planted thousands of trees, predominantly oak, ash and elm. The resulting landscape was perfectly designed to encourage those 18th Century pursuits of hunting, shooting and carriage-riding. Oliver concluded his talk with an exploration of the unlikely union of "clumps and concrete" that seemed to many arachitects to offer a suitably English form of international modernism from the 1930s onwards. He quoted Alexandra Harris's book, Romantic Moderns, in which she analysed the thinking of a group of architects, artists and academics who were wondering how to reconnect with "the headily abandoned past". One part of the movement was an attempt to reconstitute 18th Century landscape ideas in response to inter-war suburban development. Contributors to the Architectural Review suggested that the 18th Century tradition had the power to provid a guide for solving the problem of how to "reconstitute a balance between the claims of town and country". One article even included a proposition for Blenheim where the park and garden would be retained - but, in place of the palace, a block of flats would be built. Romantic Moderns, such as John Betjeman, suggested that "landscape for us has shrunk into a back garden" - and that architects, planners and politicians needed to recapture the 18th Century's scale and magnificence of vision. One young architect, Christopher Tunnard, used Capability Brown as an attempt to provide a "manifesto for modernism in landscape". And in 1950, one biography of Brown included the suggestion that his style of landscape needed to be rehabilitated - and that he was not just a landscape designer, but his work could provide a guide on how to fundamentally recalibrate post-war reconstruction, away from short-term solutions towards "a requisite largeness and length of vision". However, this vision for landscape and design required the British to sacrifice their own suburban plots to confirm the idea of landscape as "a common garden". Oliver suggested out that - from the mid-1960s onwards - Brown became part of the nation's DNA, a cultural reference point by millions of visits to publically accessible landscapes. In so doing, he added, Brown became a reassuring, conservative vision of Englishness, but this process had robbed him of the potency as a symbol of forging a new future - and not just used to celebrate the past. Over 130 people packed the hall to listen to Oliver's compelling talk and, afterwards, enjoyed some "Capabili-teas" which Ann Day had created based on recipes from the 18th Century and which have been resurrected for Capability's tercentenary year.